The visit to Toshiba’s booth at CES was interesting for a number of reasons, and their upcoming lineup is a good indication of how polarized the PC and tablet industry has become in terms of price targets and the resulting quality. At the budget end of the spectrum, Toshiba has a new 13.3” Chromebook coming out, and makes a point of this being the first ever 13.3” Chromebook on the market. While technically true, I’m not sure it really matters that much when 11.6” and 14” Chromebooks are available, but if you wanted something in between you can now turn to Toshiba. Priced at $280, the Toshiba Chromebook comes with a Haswell Celeron 2955U processor – the same CPU as Acer’s 11.6” C720 Chromebook. It also comes with 2GB RAM and 16GB eMMC storage, weighs 3.3 pounds, measures 0.8” thick, and boasts battery life of up to 9 hours. The specs are all reasonable, but build quality definitely tends towards the flimsy plastic end of the spectrum, and when Acer’s C720 delivers otherwise similar specs outside of the LCD size for $200, spending $80 more for a larger chassis may be a tough sell. It’s not a bad product per se, but overall I prefer the feel of the Acer C720. Shift to the other end of the laptop spectrum and Toshiba has a couple laptops sporting 4K displays. The two options are somewhat similar, with the Tecra W50 being for business users and the Satellite P50t going after the consumer market. Starting with the marquee feature, the display is a 15.6” 3840x2160 panel – 262 PPI. It’s difficult to say what the colors are like given the viewing environment, but at least subjectively it looked closer to producing correct colors than most laptops, and that’s a patterns we’ve noticed with many of the high-DPI panels. As far as aesthetics, the P50t is a consumer device that comes with a Blu-ray combo drive, glossy touchscreen display, and glossy keys. I really like the keyboard layout Toshiba uses (hello proper 10-key! ), but I wouldn’t mind a switch to non-glossy keys. I suppose it’s not enough to be a deal breaker, but it definitely feels a bit out of date in terms of styling. The Tecra by comparison ditches the touchscreen and instead goes with a matte panel, and it also has workstation level features like the ability to support up to a Quadro K2100M GPU. It’s also quite a bit heavier at up to six pounds (depending on configuration). Both are slated for release in the middle of the year, so perhaps there’s still time for changes perhaps, but we’ll see what happens. The last notebook to discuss from Toshiba is actually one of the nicest (perhaps even the best) looking Ultrabooks at the show, the KIRAbook. There was a lot to like about the original Ivy Bridge KIRAbook, but pricing was perhaps a bit too high, battery life was middling, and build quality (specifically, the flex on the display portion of the chassis) wasn't as good as we'd like on a premium device. With the Haswell update, Toshiba looks to have fixed at least the battery life aspect, and perhaps pricing will be a bit more compelling this round. 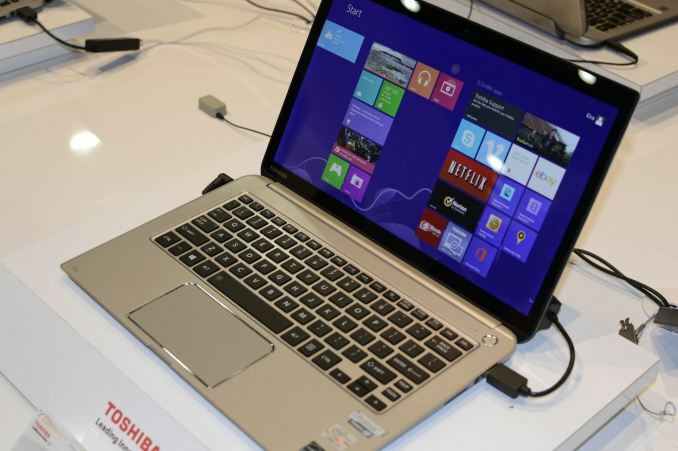 Toshiba claims up to 9 hours of battery life, which should be about right compared to the Ivy Bridge design with the same core specs. That includes a 2560x1440 (available with or without touch), a 0.7” thick profile, and a weight of just 2.6 pounds. The body is constructed of AZ91 magnesium alloy that’s supposed to be more rigid and durable than the A6063 aluminum alloy, though I couldn’t tell you who uses the latter. Pricing and availability are scheduled for February 2014 with the base model selling for $1500; it’s not clear if that includes a 256GB SSD and 8GB RAM, but that appears likely from the press release. "...build quality (specifically, the flex on the display portion of the chassis) was far more than we like on a premium device." I owned a Toshiba thin-and-light, an r700. It was OK, but had terrible build quality (crazy amount of flex, felt like it would break in my hands), and the chassis kept shattering from pretty darned minor impacts. After the second time it shattered, not wanting to spend ANOTHER $600 to replace the stupid metal shell (because apparently that costs a fortune even though no electronics are involved), I bought an air. It weighs even less, but feels like a bloody tank in comparison. "Really, why do people like numpads on laptops?"